OMI represents the family of audiometers from Monitor Instruments and sound booths from Acoustic Systems. These high quality instruments have features that are ideally suited to the needs of industry and comply with all OSHA test requirements and ANSI Standards for Audiometers. 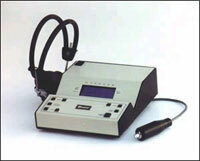 The MI-5000 is one of the lowest-priced microprocessor audiometers available today. It is compact, easy to operate, and has a fully manual override capability. It is designed to be used with or without a printer. Its LCD simultaneously shows all thresholds at the end of each frequency tested. The MI-5000 provides valid, reliable data quickly and cost effectively. Utilized with OMI Audiometric Software, test results are compiled into usable report formats that are necessary for an effective hearing conservation program. Specifically designed for large scale hearing conservation program, the MI-7000 has an internal printer that provides archive quality printouts and 200 test memory. Fully portable, the MI-7000 was designed and tested to meet the rigorous requirements mandated by both industry and the military. Because of its small size and rugged construction, it is ideally suited for mobile testing or van installations. A talkover pushbutton is available to communicate with the test subject through a built-in microphone, eliminating the need to interrupt multiple test sessions to re-instruct a subject. Visual and optional auditory error warnings are provided to alert the technician of patient or test errors. Utilized with OMI Audiometric Software, this product effectively handles the audiometric requirements of the occupational hearing conservation program.The new, low-cost MI-3000 is now available. Call for more details. To ensure a suitable test environment, OMI offers a complete line of audiometric sound booths. OMI has a wide selection of bio-acoustic calibrators. These instruments make OSHA-required daily calibrations a quick and easy task. They are designed to work with most manual and microprocessor audiometers. Whether it’s audiometer printer paper or a new pair of headphones, OMI handles a wide variety of audiometric supplies for most brands and models of audiometers.